Michael teaches at the Dalian American International School in Dalian, China, but began his career in Brownsville, Texas. He completed his doctorate in Curriculum and Instruction while still in America, also becoming involved with the educational community through leadership roles in the Rio Grande Valley Science Association and the Science Teachers Association of Texas. He has presented at several National Science Foundation workshops, as well as national and international education conferences. He helped prepare teachers through courses he taught at the University of Texas at Brownsville. 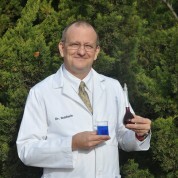 Michael has pioneered science education in the US, Uruguay, Libya, and China. In America he facilitated projects funded by the National Science Foundation focused on improving STEM achievement. In China he has developed student leaders through partnership with the Thirst4Water organization. The manuals the students have produced on running eco-projects have been distributed to over 60 schools in the region. His students present outreach programs on water conservation throughout China. Presently, he is working with the community to develop his school as the education eco-center for Northeast China.